In this poignant story directly out of World War II, the author employs many themes to show the good hearts of the people surrounding Pam. Pam is fascinated by the airplanes that inhabit her father’s air field, but girls aren’t allowed to fly or even work on airplanes. When Pam encounters the pilots of the Women’s Air Force Service Pilots (WASPs), the prohibitions go out the window. With the help of the WASPs, Pam works on an old plane and studies the math and physics involved. One of the WASPs is stricken with polio and needs an iron lung to breathe. 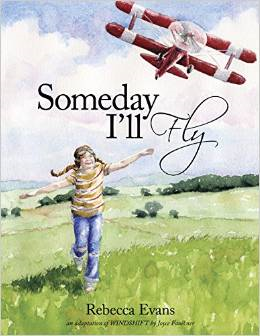 Since it’s wartime and mechanical parts are hard to find, Pam sacrifices parts from her beloved airplane to help complete the breathing machine, saving her friend’s life. Pam knows she has time and that someday she will fly. The illustrations by Evans have the look and feel of the 1940s. Details such as the wooden-sided red wagon, the mom’s house dress, and the realistic iron lung help that feel. The kitchen cabinets and appliances look right for the time. And the airplanes are certainly right. Even the names are right for the time. First graders and older can learn about the WWII era, women’s roles, and polio. Literacy and comprehension are enhanced by the lively illustrations.